SCOTT has launched a new footwear collection with 100% reflective uppers, designed for riding ‘from dusk till dawn’. With an aim of meeting demands from the lifestyle/commuting segment, SCOTT has released the new footwear concept for extra visibility when riding at night. Comprising three different models targeting Road, MTB and Sports riders, all versions in this new standalone line-up feature entirely reflective uppers. 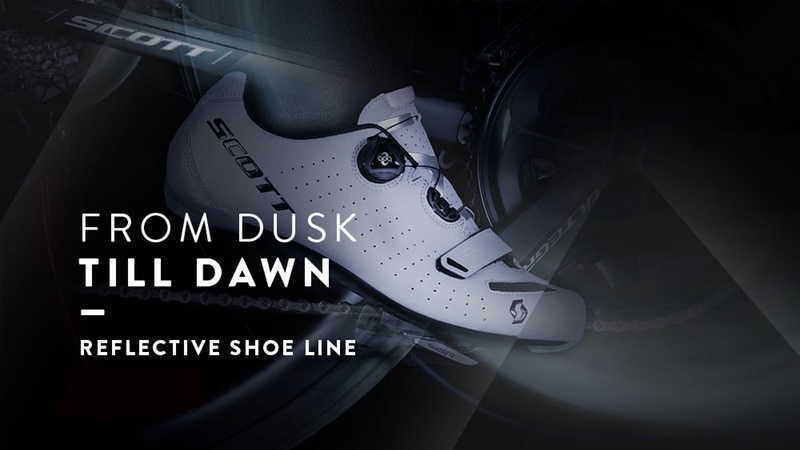 ‘From Dusk Till Dawn’ is SCOTT’s marketing campaign behind the reflective shoe collection that embodies the idea of riding from sunset till sunrise. Using SCOTT Comp BOA and Crus-R BOA models as a base, the company added a casual looking reflective upper. The Comp Boa Road Reflective and the Comp Boa MTB Reflective are positioned as the answer for those who prefer a classy shoe offering extra safety without sacrificing on performance. With a stiffness Index of 6, these models are made to turn the way to work (or back home) into training sessions – on road, trails or gravel. SCOTT adds that laid-back sporty riders on the other hand will find joy with the Crus-R BOA Reflective. This is positioned as a go-to option when exploring urban areas even after sunset. All three models are available as women’s and men’s versions. Featuring a stiffness index of 6 in combination with a fully reflective upper, commuters should find this a versatile shoe that ‘fulfils any need for a performance training shoe while adding to the rider’s safety’. Using the DNA of the road version, the MTB Comp Boa Reflective is a versatile cross-country shoe with anatomic fit and an upper material keeping the rider visible on urban trails. Crus-R’s from SCOTT have out-of-the-box comfort and a diverse range of use. Adding a reflective upper, this shoe gets now even more versatile for laid-back rides exploring urban areas after sunset.